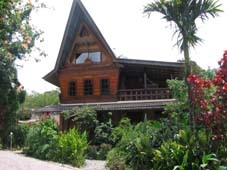 Tabo Cottages situated on the shore of Lake Toba at Tuk-tuk offer a relaxing place to enjoy the magnificent views over the lake, mountains and their tropical garden. The restaurant at Tabo Cottages specialises in vegetarian food and great fresh bread from their own bakery. All rates are including breakfast buffet for 2 pax, tax and service. Very nice view of the Toba Lake. And free WiFi everywhere (also in the room). 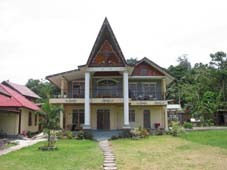 I stayed at Tabo in 2008, July, and had a good experience there. 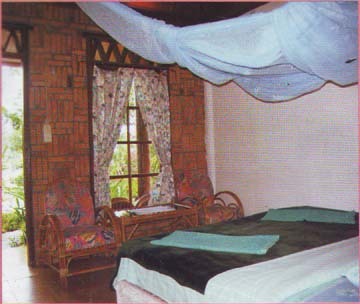 I choose a standard room, in a separate batak style house. Calm, clean, bathroom in good condition (may be warm water limitation). Wonderful view on the Bagus Bay, but the best part is the breakfast, especially the home made bread, including schwarzbrod (German style). And Annette is taking care of her customers. Price : 165 000 Rps for double bed, incl. 2 breakfasts. Negotiated for a 3 nights stay. unpleasant smell of old sweat and body odor from the pillows and the mattress. 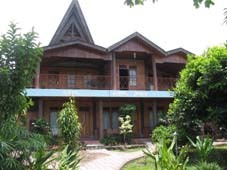 bet is to arrive at Tuk Tuk and search for your hotel on arrival. 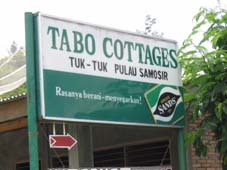 Have you stayed at Tabo Cottages?